A Holy man (whom I assumed at the time was Jesus), appeared in a long white robe and above his head was a radiant glowing crown. He walked along the river’s bank studying intently the waters flow. He walked for some distance looking continuously into the river and as he walked the river bank I followed him. He realized, I felt, but did not acknowledge, my presence at this time. I knew that he wanted me to follow his footsteps along the river. The scene changes to a mammoth waterfalls - a three tiered waterfalls with plummeting water of great force and tremendous volume. It seemed these waterfalls reached all the way up to heaven. 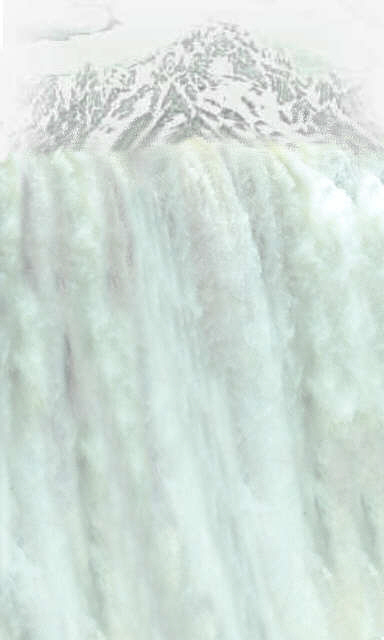 The heavenly man proceeded to walk directly up the waterfalls. I, in turn, followed him although extremely terrified. It was a treacherous ordeal for me to say the least but I knew I had to follow him. The waterfalls seemed to have stones in them which I used as steps to help my climb up the turbulent falls. I was, as I remember, scared to death. After I reached the top of the highest falls, I found myself on top of a mountain. A very awesome mountain-top in fact. I saw the heavenly person standing there with his back toward me - he was looking upward - arms outstretched, palms upward. As he stood there I felt with all certainty, that he was communicating with the Great Almighty God. No words were spoken (out loud that is), but I knew he was conversing with the Supreme God. Thick dark mysterious clouds surrounded the mountain top and swirled around me like a thick fog. The feeling there on the mountain top was a most unforgettable and Holy experience indeed. I felt a sanctified glory in the air as if the very presence of God was there in the mist. A total awesomeness from the whole experience was beyond explanation, and one I shall never forget. I remember ignoring them and then continued to follow the Holy man down the falls. The scene below was of a bazaar or fair. Many people had booths set up to sell handmade items and crafts. Homemade items were sprawled out over the grass as well. The Holy figure walked into one little shop where the workers had been making Easter candy. The workers were out to lunch at the time but there were various pieces of Easter candy laid out on the table. The Holy man picked up a piece of the candy, looked at it inquisitively, then he tasted it. He was quite unfamiliar with the taste and was wondering what it was. “Easter Candy.” I heard myself say out loud, realizing his wonderment. “Easter Candy.” He repeated after me, then immediately laid it back down as it was strange in his mouth. He then left the shop and I continued to follow him. We observed many people buying pretty flower crowns from a vendor with a small stand. Everyone seemed to be wearing these beautiful flower crowns. They were very pretty indeed and for a moment I wanted one too, but as if through telepathy, the Holy one said ‘No’. I also sensed that he did not want me to participate in any of their activities. I did as I was told and did not buy a flower crown. In this scene the Holy one finally acknowledged me behind him, as he looked straight at me and a very loving feeling overwhelmed me. He was, without speaking, telling me that I was one of the chosen people of God and I was to be given a special task to do. I felt very joyous inside. Very positive and confident of his acceptance. Although I had looked right into his eyes, his face does not register in my mind today, only the overwhelming feeling of a holy kind of love and acceptance. The scene changes to a very large room filled with people. I believe they were all ‘women’. They were seated and being seated in pews. I was among them. We were all waiting for the Messiah. The Holy one had gone from my dream at this point, I know not why or where he had gone. All the people had their beautiful flower crowns upon their heads. They all seemed happy and confident having on these crowns. I know that I did not have on a flower crown and assumed this was the reason why everyone was staring at me. They whispered to themselves while others looked at me as if singling me out. I then asked the lady seated next to me ‘why are they all staring at me’. She told me that I had a glowing radiant crown on my head of which they were all intrigued. I felt my eyes look upward and sure enough I saw a brilliant shining glow above my head. It was not a tangible crown but rather like a glow from a hundred candles. Instantly I knew this crown was a gift from the Holy one and was not unlike his own. I was very glad that I had not purchased one of their pretty flower crowns, as I was now aware of the fact that their crowns would soon wither away. Mine was the real thing and would last forever - this I felt with all certainty. I sat there feeling quite at peace. My heart was very still and I quietly awaited with the others for the coming of the Messiah. A joyous happy feeling filled my entire mind, body and soul. A contentment beyond words. From that very day forward I have been diligently studying, learning, seeking knowledge and wisdom beyond that of the ‘flower crowns’.